Tens of thousands of people with type 1 diabetes in England are being denied access to a "life-changing" blood sugar monitor due to a postcode lottery, data suggests. 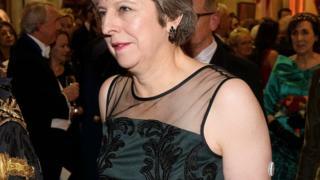 The Freestyle Libre, used by Prime Minister Theresa May, was made available on the NHS last November. But an investigation by the BMJ found a quarter of local NHS groups in England did not recommend them for patients. Health bosses said the "NHS does not have unlimited resources". Flash glucose monitors work via a sensor attached to the skin and allow people to check their blood sugar levels by using the device with a portable reader or a smartphone app. They reduce the need for finger-prick blood tests and can make it easier for people with diabetes to manage their condition. But Freedom of Information requests made by the BMJ found that while some clinical commissioning groups have made the devices available to hundreds of patients, others have not made them available to anyone. Based on the data received by the BMJ, Partha Kar, NHS England's associate national clinical director for diabetes, estimates that just 3-5% of patients with type 1 diabetes in England are currently able to get the monitors on the NHS. If CCGs were following NHS England guidance correctly, this figure should be closer to 20-25%, if not higher, he said. Mr Kar said some CCGs were merely paying "lip service" to offering the monitors. About 400,000 people in the UK are estimated to have type 1 diabetes. About 29,000 of them are children. Victoria Hill, 24, who was diagnosed with type 1 diabetes when she was six, is not able to get a Freestyle Libre monitor through her CCG, despite the fact her neighbouring CCGs offer it. She started paying for the monitor herself after benefiting from the device during a trial. But she found herself unable to afford the monitor while she was saving to buy a house. A Freestyle Libre starter pack, which comes with a reader and two sensors, costs £159.95. Sensors cost £57.95 and need to be replaced every two weeks. After buying a house, she has since started paying for the monitors again. She said: "I'm absolutely chuffed - it is life changing. "I've been on multi-syringes and then moved to [insulin] pens but this is the one thing that has made a difference to my life overall. "It is the most frustrating thing in the world that in Gloucester, which is five miles down the road, they are getting it on prescription and I'm not. "Why are they more deserving than me? I am able to afford this but there are people out there who can't and they are really missing out." Consultant diabetologist Emma Wilmot said Freestyle Libre, the only flash glucose monitor available in the UK, was one of the biggest "life-changing" advancements in type 1 diabetes care for many years. She said some of her patients were considering moving to a different GP practice a few miles down the road to get the monitor, while others were making "huge sacrifices" to pay for it themselves. "My worry is the people who aren't in a position to self-fund it," she said. "The most deprived people in the population often have the least access." Meanwhile, official prescribing data obtained by the diabetes campaigner Nick Cahm and shared with the BMJ suggests that, as of July 2018, just 2% of patients with type 1 diabetes in England were getting Freestyle Libre on GP prescription, compared with 11% in Scotland, 16% in Wales, and 35% in Northern Ireland. Nikki Joule, from Diabetes UK, said patients were facing an "unfair postcode lottery". She added the charity wanted to see all areas agree on policies for accessing the monitors. Julie Wood, chief executive of NHS Clinical Commissioners, which represents CCGs, said: "Clinical commissioners have a responsibility to consider the needs of their whole populations, reduce inequalities, and improve quality of care while living within the funding they are given and it is right that they should follow a due process when considering new medicines and technologies to ensure they are making the most effective use of the limited NHS pound."